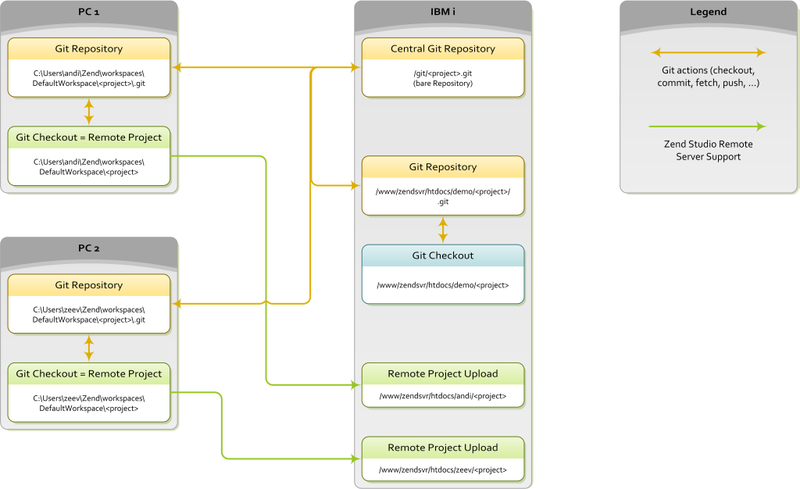 This article shows how to set up a proper development environment for a PHP project on IBM i using Git for version control. This information is offered “as is”. At Hieden Software, we’ve been developing a PHP application meant to run on IBM i, so IBM i is where we host and test our code. At first we installed Git on our Windows PCs, accessing our IBM i–hosted PHP scripts using mapped drives, but the mapped drives were too slow. To gain the speed we needed, I installed Git directly on the ‘i’. Now our IBM i hosts both Git and the PHP scripts it manages, providing not only efficiency, but a demonstration of the versatility of IBM i. Throughout this article “andi” and “zeev” will be used as user names while “<project>” is, yes you guessed right, the actual project name. “ibmi” is used in a few places as the system name. All in all it should be rather self-explanatory. The following picture shows what parts are installed where and how they interact. The detailed description on the installation and configuration process follows thereafter. The blog post A successful Git branching model by Vincent Driessen describes the workflow I wanted to utilize on my project perfectly, so I won’t discuss it any further in this article. Thanks to Michael Perzl’s fantastic site ( perzl.org), IBM i binaries of many OpenSource projects are available. Though, prior to installing Git you need to prepare your system according to Open Source Binaries (you don’t need to install any packages using wwwinstall.sh – this script points to the old IBM binaries). $ git config --global user.name "Andi Suraski"
$ git config --global user.email "andi.suraski@example.com"
$ git commit -m "Initial repository commit"
$ git tag -a v1.0 -m "<project> v1.0"
Now you’ve got the basic repository and are able to share it with your co-workers. So it’s time to setup the central (bare) repository. The following needs to be done on every developer PC. The pictures and commands suppose the user is named andi. If SSH is not yet started, start it now. On i/OS V6R1 and higher, run the command STRTCPSVR SERVER(*SSHD). For V5R4, see the instructions at SSHSetup. On the next page select which code libraries you want to utilize in your Git project You may skip this step and do it later, since it’s not required for Git setup. When Zend Studio has finished importing the Git repository and setting up the project, it’s time for you to open the “Git Repository Exploring Perspective”. Customize the view using “Window -> Show View” if you desire. I’m using all of the Git views more or less frequently. In my case the local master branch was not created automatically. 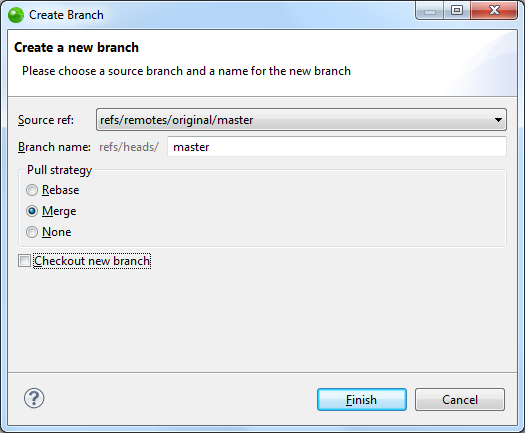 You can do that yourself by right-clicking the original/master branch and selecting “Create Branch...”. Since you create it from a remote branch you should choose merge as pull strategy, so you will get a tracking branch, which simplifies the process of fetching and merging new commits from the central repository. 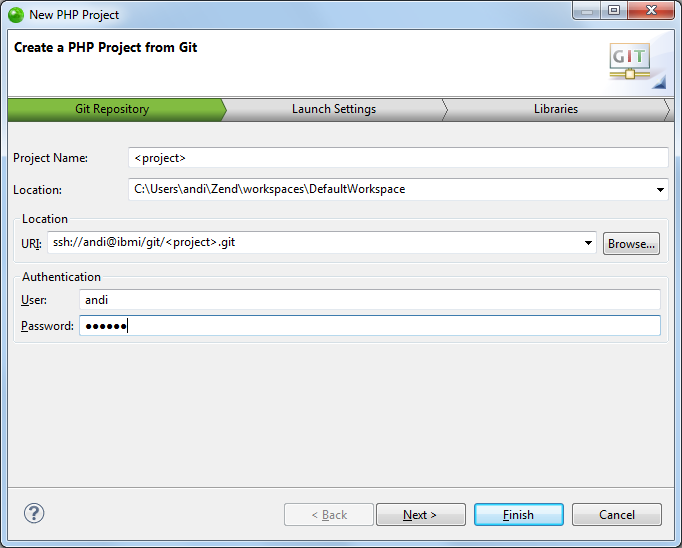 By default git push is configured completely wrong in ZendStudio. 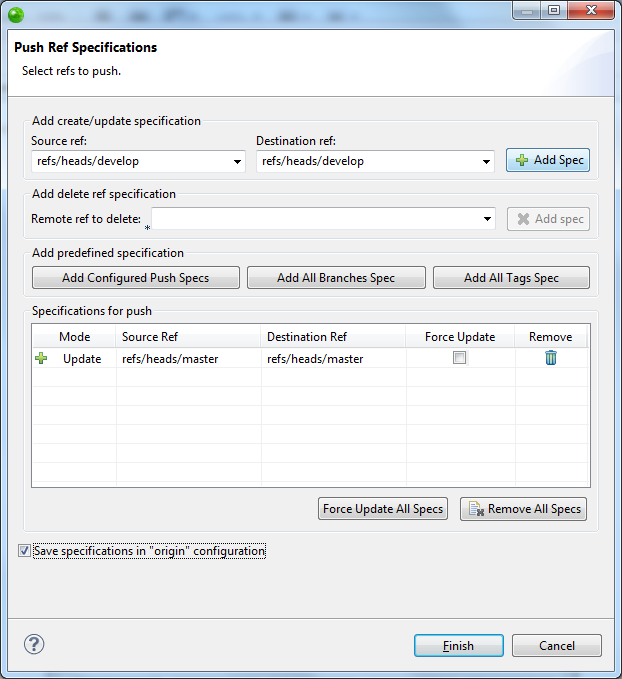 To correct this, go to “<project> -> Remotes -> Original” and right click “(Push) ssh://andi@ibmi/git/<project>.git” and choose “Configure Push...” Under “Ref mapping” choose “Advanced” to get the “Edit (Advanced)...” button and use the following dialog to change your settings in this way (the develop branch should be added too). 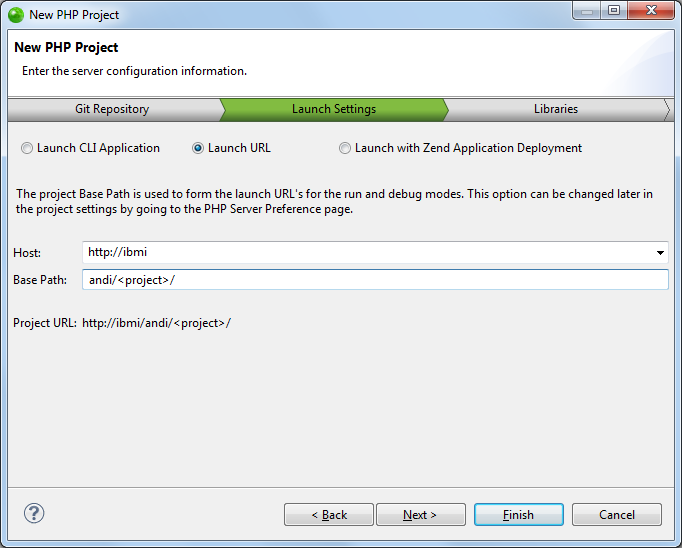 After that you can configure your Zend Studio project to upload the files to your IBM i. In the “PHP Explorer” View you should right-click your project and then select “Properties...”. 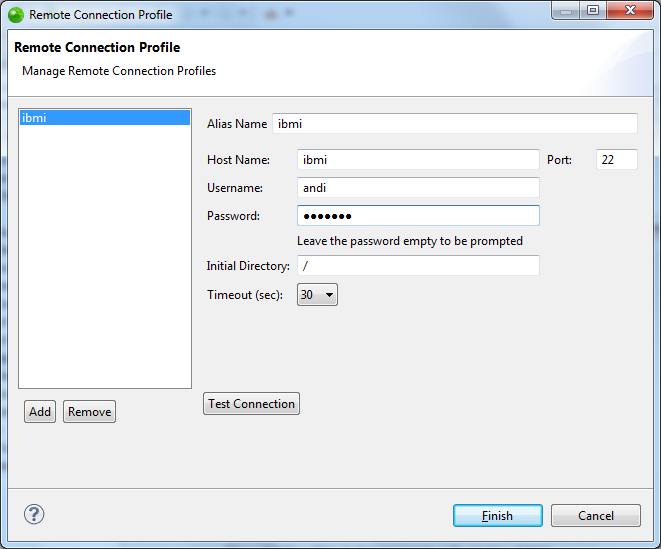 To specify the Remote Connection, if you have not done it yet, choose “Manage”. Finish the connection setup and press Ok and your project will be uploaded to your IBM i. Now you’ve done most of the work. You only need to setup standalone Git on your PC. Git can be obtained from Git - Fast Version Control System. The installation process is fairly easy, so I won’t cover it here. 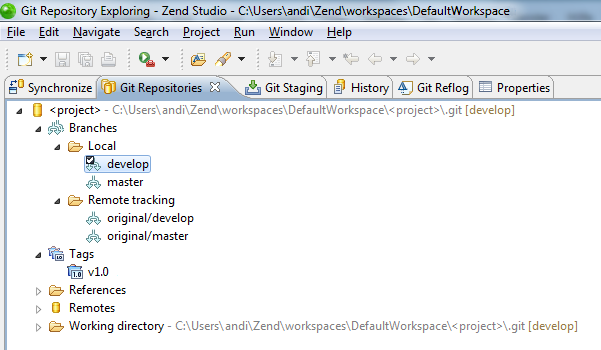 What’s more interesting is that, by default, Zend Studio and standalone Git will use the same configuration file, so you don’t need to configure anything since you already did that in ZendStudio. Of more interest is the question why do I need Git installed as standalone too, rather than relying on the Git support in Zend Studio? 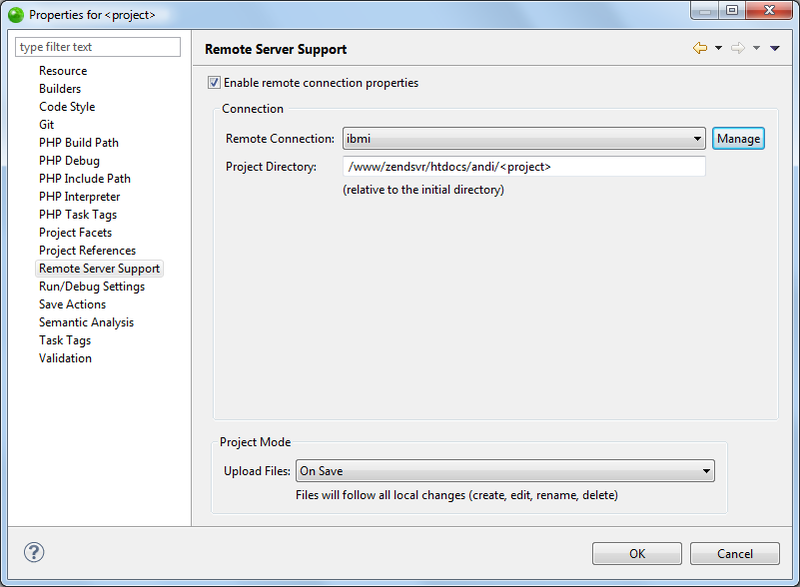 EGit/JGit, the version of Git used by Eclipse, has two problems as of Zend Studio 9.0.4. First, it will ignore the configuration directive merge.ff which causes my merged branches to be not as distinguishable as I’d like. Second, I need to know whether the files changed between two commits. Not what exactly changed, just the files names. With Git this is easily doable using “git diff –name-only”. I haven’t found a way doing the same within Zend Studio. If you know of one, please let me know. As I found out since first writing this article, you can easily update Git in ZendStudio without upgrading to a newer ZendStudio version (thanks Alan). So you can (and I already did) update EGit to version 2.3.1 - which recognizes the merge.ff directive - without having to buy new ZendStudio 10 licences. If there’s interest I can show how to do this as well. Setting up Gitweb is not necessary but it’s a good way to see what exactly is in your central Git repository. But be aware, it’s rather cumbersome to get running. Because you ran the wwwinstallgit script earlier, your system contains most of the files needed for Gitweb, but the files must be copied to new locations. In /var/www/git you find the files you need. It doesn’t matter where you place them as long as your HTTP server finds them, with one exception: gitweb.cgi MUST be placed somewhere under /QOpenSys. Otherwise it won’t be recognized as an executable script. Now you need to make a change to /QOpenSys/cgi-bin/gitweb.cgi in order to get it working on IBM i. Otherwise you will only see EBCDIC characters. # These tell gitweb the URIs for the images and css it needs. What is left is to tell your HTTP server how to access gitweb. Add the following directives in /www/zendsvr/conf/httpd.conf or whatever Apache instance you use for PHP. # Replace the 1141 CCSID value with the appropriate one for your system. Why am I using a new CL program as ScriptAlias? Well, I haven’t found a way (and I took ages to look for one) to properly pass the parameters to the perl-script without the wrapper program GIT/QCLSRC(GITCGICL). The CGI wrapper for Gitweb does work but it requires a lot of steps.. Sorry for that, but as I mentioned earlier, I couldn’t come up with a better one and therefore would welcome suggestions to simplify the process. I was glad that I did find at least a working one. You managed to install and setup an up to date version control system on your IBM i. No more need for documenting each and every change manually, Git will do this for you. No more need to tell other developers to not touch the files you’re working on, Git will merge changes of the same file for you. No more need to wait for started features in a small release, Git will have it in a separate branch. We’re running Git for a year now and we’re still amazed at what this little piece of software can do for us. Thanks for motivating me to write this article and doing the proofread on it. And thanks for being an overall great guy and such an active community member. Thanks for pointing me in the right direction at setting up ZendStudio. Thanks for sharing your knowledge on YiPs. Thanks for maintaining this huge collection of IBM i binaries for open source projects. Thanks for writing such a great book and sharing it with everyone. Thanks for posting your experience with Git.